As on Earth, so in space. A four-satellite mission that is studying magnetic reconnection—the breaking apart and explosive reconnection of the magnetic field lines in plasma that occurs throughout the universe—has found key aspects of the process in space to be strikingly similar to those found in experiments at the U.S. Department of Energy's (DOE) Princeton Plasma Physics Laboratory (PPPL). The similarities show how the studies complement each other: The laboratory captures important global features of reconnection and the spacecraft documents local key properties as they occur. The previous MRX findings served as guidelines for measurements taken by the MMS mission, which seeks to understand the region in which the reconnection of field lines in plasma—the state of matter composed of free electrons and atomic nuclei, or ions—takes place. The latest PPPL experiments extend the findings to new areas of agreement. "Despite huge differences in the size of the reconnection layers in the MRX and in space, remarkably similar characteristics are observed in both," said Masaaki Yamada, principal investigator on the MRX, and lead author of the recent paper reporting the results in the December 6 edition of Nature Communications. The past laboratory research examined "symmetric" reconnection, in which the density of the plasmas on each side of the reconnection regions are roughly the same. The new paper looks at reconnection in the magnetopause—the outer region of the magnetosphere—and in the MRX that is "asymmetric," meaning that the plasma on one side of the region is at least 10 times denser than on the other. 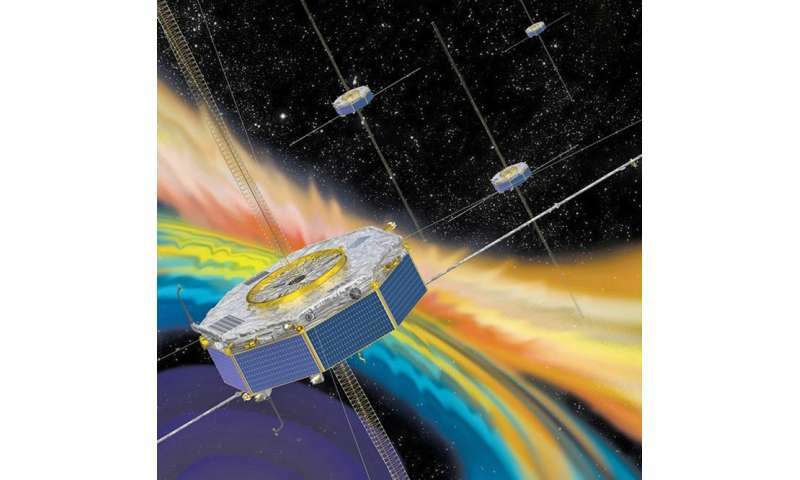 The MMS mission has focused its initial research on the asymmetric aspect of reconnection, since the plasma in the solar wind—the charged particles flowing from the sun—is vastly denser than the plasma in the magnetosphere. In the new paper, researchers examine what is called the "two-fluid" physics of reconnection that describes each behavior of ions and electrons differently during the process. Such physics dominates magnetic reconnection in both MRX and magnetospheric plasma systems, allowing for an unprecedented level of cross-examination between laboratory measurements and space observations. 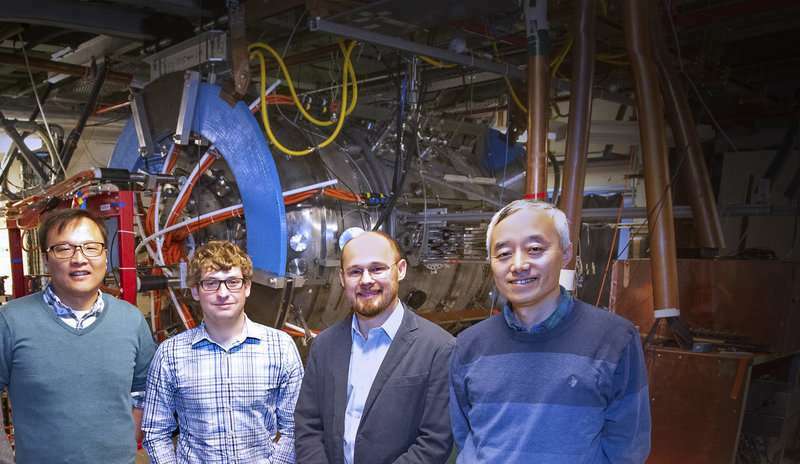 Members of the MRX team with the device in the background. From left, Masaaki Yamada, Jongsoo Yoo, Jonathan Jara-Almonte, Will Fox, and Hantao Ji. Credit: Elle Starkman/PPPL Office of Communications. Electrons. The experiments demonstrated that electron current flows perpendicular, and not parallel as once thought, to the magnetic field. This flow is key to the conversion of magnetic energy in electrons that occurs in a narrow boundary layer called the "electron diffusion region" where rapid reconnection takes place. The finding is consistent with the recent MMS space measurements and new in the laboratory for asymmetric reconnection. Ions. The ion current also flows perpendicular to the magnetic field as in the electron case, and likewise is key to the conversion of ion magnetic energy to particle energy. For ions, this conversion occurs in the wider "ion diffusion region" between converging plasmas and is a similarly recent finding about asymmetric reconnection in laboratory plasmas.